US manufacturer, A-dec, a world leading producer of dental chairs, delivery systems and dental lights, recently purchased two new MecWash aqueous parts washing systems for use at its Oregon production facility. The MecWash machines were introduced to meet the company’s dual objectives of achieving optimum parts cleanliness and to support its recent decision to become a zero-discharge industrial wastewater manufacturer. This decision prevented A-dec from having to apply for an industrial wastewater discharge permit with its city municipality. The new equipment, which includes Midi 800 and Duo 800 aqueous parts washers coupled with an Aqua-Save Junior water reclamation unit for each system, form closed-loop wash systems which meet the new state environmental regulations, while attaining industry-leading parts cleanliness. The Midi 800 is a compact, fully automatic and self-contained aqueous cleaning system that meets the highest medical/dental cleanliness and inspection standards. It features an extended inner cleaning drum to accommodate more parts washing by volume. Ideal for cell-manufacturing or within a centralized layout, this highly versatile single chamber rotational cleaning system features immersion/spray wash, ultrasonics, immersion/spray rinse, and vacuum dry. Proven MecWash aqueous technology cleans without solvents or emissions, and is effective for cleaning both large and small components in purpose-built fixtures or standard size stainless steel baskets and plastic totes. The Midi 800 has a cabinet size that allows for an Aqua-Save Junior to be constructed inside of it, so no additional floor-space is required for this unique water reclaim system which eliminates all wastewater discharge. This proven technology captures the wash and rinse water, separates the wastes (dirt, grease, grime, etc.) from the water, then returns the now purified water to their respective tanks. The only effluent resulting from the Mecwash and Aqua-Save systems is concentrated waste consisting of oils washed from the dirty components, which represents a significant savings in disposal costs. Additional savings are achieved in time to refill process water tanks, energy savings to heat the solutions, and handling of wastewater throughout the process. The Duo 800 is a compact, fully automatic and self-contained aqueous cleaning system that meets “visually clean and dry” cleanliness and inspection standards for the medical/dental industry. The Duo 800 is equipped with an extended inner drum to accommodate the 28 – 29” flex pivot-style dental lighting arms. Ideal for cell-manufacturing or within a centralized layout, this highly versatile single chamber rotational cleaning system features immersion/spray wash, spray rinse, and hot-air dry. Proven MecWash aqueous technology cleans without solvents or emissions, and is effective for cleaning both large components like these A-dec dental light arms in purpose-built fixtures as well as small components in standard size stainless steel baskets and plastic totes. The Aqua-Save Junior will sit beside the Duo 800, occupy minimal floor-space of 2’ x 3’, and serve as the Duo’s closed loop water recycling system. The Duo wash chamber includes numerous high volume jets that thoroughly penetrate and saturate the workload whether placed in metal baskets or plastic containers. Full rotation of the workload at 3 rpm exposes all surfaces to the wash and rinse solutions to ensure effective cleaning, draining, and drying. Alternately, parts with simple geometries can be programmed to gently oscillate from side to side. The washing and rinsing process is followed by a high velocity heated during cycle which completely dries in a total cycle time of 5 – 10 minutes (typically). The rinse process can also be used to apply a longer term corrosion inhibitor for ferrous components. 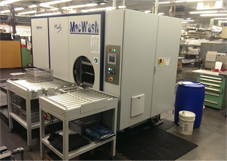 “We’re pleased that A-dec has entrusted MecWash with its parts washing needs,” said Bill Westbrook, MecWash’s North American Operations Manager. “As an industry leading manufacturer of dental equipment, A-dec clearly values the cleanliness of its components. We’re thrilled to provide a cleaning solution that meets the company’s meticulous cleanliness standards with zero-discharge of wastewater in a cost-effective manner.